Home > Alien Contact > Why Don't Aliens Make Open Contact? One of the most intriguing questions that supporters of the extra-terrestrial interpretation of the UFO phenomenon are forced to grapple with is why, if aliens are visiting our planet, they don't make open contact. Why not park a flying saucer in Downing Street or land a spaceship in front of the Eiffel tower? Some sceptics seize on this question scornfully as if the lack of any good answer to it proved that the whole UFO phenomenon was bunk, the product of either fraud or fantasy. Ufologists retort, however, that there are perfectly good reasons why the aliens might want to keep their presence secret. One speculation is that the aliens have some kind of moral code which prevents them from large scale interference in the affairs of a less advanced civilisation. This would resemble the Prime Directive of Star Trek, the rule that forbade Starfleet vessels from altering the natural development trajectory of planets which had not yet attained high-level technology of their own. Over the sixty years or so in which the notion that we are being visited by aliens has been widely disseminated, various individuals have claimed to have been specially anointed by the aliens to carry their message to mankind. George Adamski was one, a former hamburger stall operator who carved out a new life for himself as a quasi-cult leader; Billy Meier, the one-armed Swiss farmer who claims to be regularly visited by the Plejaren, a race of super-advanced humans from elsewhere in the Galaxy, is another. Certainly for these people, the question which forms the basis of this article is rather crushing. If the aliens want to impart some message to us, surely it would be better to do it publicly rather than confiding it to a private individual? The usual response of the purported alien contactees is that the human race is yet not ready for open contact with the extra-terrestrials because our level of spiritual consciousness is too low. Only the contactees themselves have somehow attained the spiritual understanding necessary to fully appreciate the alien message. This is exactly what Billy Meier says he was told. 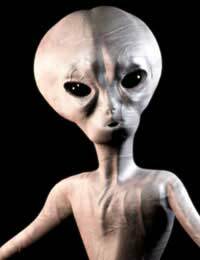 He was asked to convey warnings and prophecies to mankind from the aliens and try and bring about a general spiritual awakening. Do Aliens Want Human Genetic Material? The most sinister answer to the question of why the aliens don't make open contact is that they are not well-disposed towards us. After all, if your intentions are hostile, why announce your presence? Knowledge of it could only inspire resistance in the target population and complicate the achievement of your goals. But what are those goals? Some UFO researchers believe the aliens are here to harvest human genetic material, possibly for the purpose of creating alien-human hybrids. Conspiracy theorists go further. They insist a "deal with the devil" has been made, a secret agreement between the aliens and our own governments which would allow the ETs to prey, to a limited extent, on the human populace in return for sharing some of the secrets of their technology. If so, it seems a curious arrangement. After all, if our governments started openly using alien technology, surely some questions would be asked? Where did you get that flying saucer, Mr. Prime Minister? The deal, if it exists, then, would mean that our governments have advanced alien technology which they cannot openly use. Why would they enter into such an agreement? Perhaps the Cold War tempted them. Warehousing alien super-weapons which could be rolled out in the event of a Third World War might have seemed an attractive idea at the time. A variant of the genetic harvesting hypothesis, but this time a benevolent one, is that the aliens are from the future. Perhaps they're not even aliens at all, just highly evolved humans. According to this interpretation, our mysterious visitors know that something terrible is about to happen to Earth and want to preserve a record of our biology, perhaps so it can be recreated elsewhere. Or maybe they will one day rekindle life on Earth if we somehow manage to wipe it out ourselves, by fighting a nuclear war, for example. But if the aliens know something bad is going to happen, why not intervene to stop it or at least warn us in advance? Maybe they're not allowed to interfere, or maybe they know it's already too late. What could the catastrophe be? Global warming, perhaps, or a giant asteroid about to hit us in 30 years. Who knows? As you can see there is a wide range of speculation about why extra-terrestrial visitors might choose to shun open contact with the Earth's population. Some suggestions are more plausible than others but, taken together, they convincingly refute the view of some sceptics that UFOs can't be real just because the aliens don't land and say "Hello". Have You Been Abducted By Aliens? Aliens. Have. Their own agendas plural. Some good. And some not...mixed bag. Look at human nature and. Expand. On. That. The answer lies.Within ourselves? Just a note to say thanks for running this site and featuring comments as well. Insofar as governments, military units and other power blocs are concerned, please bear in mind that any disclosure, either confirming the existence of ETs and their craft or any communication with them, would NEVER be in their interest. They have nothing to gain from such an admission (after all these years of denial!) and everything to lose: 1. They would have to confess that they have no way to stop the visitors from coming and going and doing as they please with their citizens, livestock, whatever. 2. They would reveal their helplessness and prevarication for decades, thus losing whatever trust and respect still remains for them. 3. Questions would be raised. "What is the government good for?" "Why are we paying for such a huge military establishment when it is so primitive and useless?" "What else are they holding back and not telling us?" Better to keep stonewalling, until the wall crumbles. For that I suspect we have to look to Russia. Just my feeling. Oh, pullleeeeease! If aliens are real (and I have no reason to doubt it) then all this rubbish about doing secret deals with human governments, 'moral codes' preventing 'interference'.... blah, blah, blah,,...it's ALL a load of crap. Truth is, if they wanted to hurt us, they would. Here's another truth - we have absolutely nothing they need or want, so why would they 'do deals' with ignorant human governments? And if they're on SUCH a moral high ground, then again, I ask, why would they do any deals whatsoever with human governments, when they could simply take what they wanted without being noticed and without any of us being any the wiser? And why would they have 'secret' communications with special little snowflakes who are charged with 'bringing their message to mankind'? Sounds a bit like desperate, attention-seeking, morons with a god-complex, to me. Both of them. Seems more likely to me that they're simply here to watch and perhaps even record a spectacular cosmological show - how an entire planet of ignorant rock apes managed to wipe out themselves and their planet through something as petty as greed. Just goes to show - we're all so stupid, we'll believe anything anyone tells us. Ugh. That is a very negative "opinion". Maybe these extra terrestrials don't wanna make such a big appearance to the public because they know it will scare us. Maybe we should all call out the government and ask what they know. If they wanted to hurt mankind why would they wait this long? It seems very possible they are easing it in. A mixing of dementionsis something that shouldn't be rushed. This is probably why they are not making global contact. Because negative reactions will happen even if they are here for a positive reason. The few UFO sightings that have happened caused negative reactions. The explains why most alien movies are about them taking over. Do some research about outer space everything works off energy. So the energy in this post is very negative for someone who doesn't know the truth. But if I was them and I saw this negative post I'd clearly be able to see that humans as of right now aren't ready for global contact. Because of all the negative paranoia we have created. An example on negative paranoia "illuminate"
After four VERY close-encounters with Unidentified craft/objects and many,many years of Paranormal/supernatural phenomenon, I have little time for the frightened skeptics in life! One encounter a oval-craft some eighty-ft directly above me, created a time-portal and then exited through it! I watched this scenario for ten-mins! Yes I have contacted many research-groups put it on my facebook and contacted Mufon/bufora. have always been willing to undergo ANY tests to prove the validity of my encounters both Alien/ufo and daemonic! also appeared on TV and radioshows, ran my own UFO group in norfolk for five-yrs. Been psychic since a child, studied Occult for over 38yrs. Of course the US black-covert groups have been working alongside a number of Malevolent-alien-species! Of course the Dumbs the deep underground bases are form macabre/scientific experimentaions! Frankenstein is a childs story compared to what goes on DOWN there! It strikes me as incredible that so many humans still do not believe in the existence of dimensional and ET Beings! check me out on thomas thompson facebook. There WILL be an open contact shortly, and it will be heralded by a large-explosion seen on the dark-side of the Moon! An invasion shall then happen via benevolent-species not Malevolent as portrayed by some over-enthusiastic Liars! The bigger question is: why SHOULD They make open contact with humans? Who are humans to ever dictate that this should be so..?It is an assumption at best to think that They care to graciously appear to humankind..I think humans place too much import upon their own existence here on earth; and they, humans, wish for everything to reveal itself to them as if entitled.This sense of entitlement that humans have incrementally acquired has become tedious in appearance one would assume.Not everything in this fractal is going to love you like the mother in a fairy tale, so why would They land on your lawns to guide you into a bright future? !